The smart cards project focuses on developing an innovative and easy payment solution in the form of a common electronic card system. It is a multifunctional system that can be used as payment for public transport, to register for different social services (e.g. catering services), for city car parking, park and ride or access to different kinds of discounts for certain social groups. • To achieve greater convenience for residents. 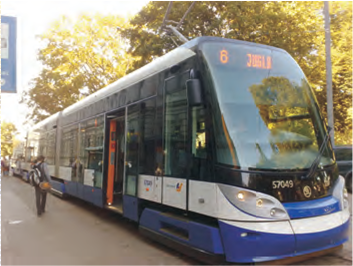 The project started in 2007, with the aim of creating an electronic payment system for public transport in Riga and to ensure its functionality. By using new technologies the system aims to provide an effective, efficient and inclusive service to all inhabitants. Political leadership with a long term approach - Riga City Council has had a key role in this initiative, by both introducing it and providing the finance. In addition, the departments of Traffic, Welfare and Education work together to ensure the scheme is successful. Collaboration and dialogue with all stakeholders - The limited liability company “Rigas karte”, created specifically for this initiative, owns and promotes the e-card in public transport and develops the system for other social purposes.“Rigas satiksme”, the transport company owned by the municipality, deals with public transportation and owns the public transport fleet. Contribution to multiple policy objectives - the e-card system integrates different kinds of transport services with the delivery of social services; students use the same ticket to register their arrival at school as others who use it for public transport or to park their car. Business models to attract investment - model combines public sector grants and loans, alongside commercial activities. To begin with, the establishment of the project was mainly financed by Riga City Council using municipal grant and loans. Additional financing is achieved through the selling of e-tickets that can be purchased in supermarkets and ticket machines in Riga. To read a full report on Smart cards as a transport, social and education policy instrument and why it is a good example of a Lighthouse initiative click here.